When demand for products drop, as they invariably do during recessions, firms do not simply hold their inventories stable. Firms instead cut inventories (keeping their sales to inventory ratio relatively stable), which amplifies the economic effect of reduced demand. Therefore, production is not just reduced by the actual drop in demand, but is further reduced by the desire to hold less inventory, which takes a huge bite out of GDP. Incidentally, the opposite happens when demand increases: production is increased to a level higher than that of demand, resulting in a glut of product when demand starts to wane. We saw this process in action when we looked at the history of housing production, for example. Notice that during economic down cycle years (e.g. 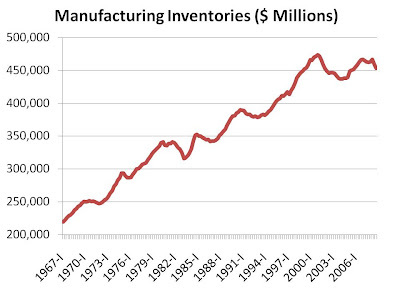 early 80s, early 90s, early 2000s), inventories can be reduced by upwards of 10%. On the other hand, boom times result in tremendous inventory increases. 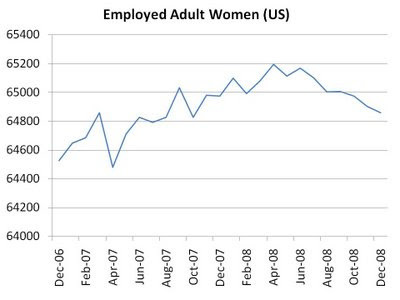 This chart takes us to Q3 of 2008. As demand continued to wane in the fourth quarter of 2008, companies have been focusing on cutting production and reducing costs. As such, it is likely we will see a large drop in inventories when we see look at chart again once data from Q4 of 2008 is included. When you look at the balance sheets of the companies you are analyzing, take a look at their inventory levels and you will likely see this process taking place at a micro economic level. Disagree with some of the government's decisions with respect to the bailout? The Bailout Game lets you chart your own course through this economic downturn. Banks and industries come to you for help, and you decide which ones are worth saving in order to help save the broader economy! The authors have their own ideas of what the government should have done, and they will score you accordingly for each of your decisions. A wrong move on your part can destroy other companies, while a right move keeps the recession at bay. This interactive tool is also a fun way to learn or re-visit some of the events of the last year that have put us in this position. Debt: Look at your candidates and consider how much debt they have. The more debt they have, the less likely they can weather potential storms (or black swan events). 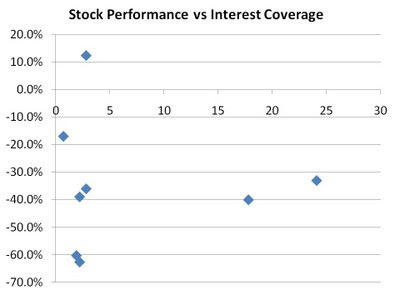 Don’t invest if the company has a D/E ratio of greater than 0.5 (i.e. look for companies with at least twice the amount of equity as debt). Consider also the debt coverage ratio and interest-only coverage ratio. Compare all of these figures to other companies in the industry, to get an idea of how much debt the industry as a whole tends to hold. Also, remember to consider its pension liabilities! Liquidity: Consider its current ratio (Look for 2+ minimum), compare to its industry, and to the same company over time. What is the trend? Look for stable or increasing current ratios, or better than average for the industry. Consider its working capital - what is the trend over time? Consider also the Acid Test. Earnings: Compare the company’s sales trends, by division if possible. Compare to itself overtime, as well as the industry as a whole. Consider also the profit margin trends (You want the gross profit margin to be stable or increasing). Remove all extraordinary events (and be careful about what you call extraordinary. Is this company having extraordinary events every year? If so, they are ordinary!). Earnings Per Share: Look at the difference between diluted and undiluted. If diluted is significantly lower, this indicates that a potential purchase may not be as good as deal as you think, because if the company does improve, options will be exercised in which case your proportionate ownership will decrease. Product/Service: Compare this company’s product or service to its competitors. Is it obsolete? Does it do a poor job in its core products/services? If so, this will negatively affect its ability to operate in the future. Beware! Inventory: Has its inventory been increasing over time or stable? What are its revenue recognition policies (look for conservative policies, rather than fudged imaginary sales figures)? Value Funds: Check out Morningstar.com to see if any of the companies on your hit list are also held by value funds. This is a good indication that other investors are seeing value too. This is a double-edged sword though: If the stock IS held by other value funds, it may indicate the value no longer exists. If the stock IS NOT held by other value funds, it may have already been picked over and determined to not be the value it seems. Be careful to not let this be the sole determinant! Monster Worldwide (MWW) is best known for its monster.com website which matches employers and job seekers over the web. The company has grown quickly in the last decade, stealing share from traditional job placement advertisements and offering more efficient ways for employers and workers alike to find each other. But thanks to the economic slowdown, the stock now trades at a six year low, and sits at a P/E of just 9. But whether it represents a good long-term value investment comes down to the investor's circle of competence. Before investing in any company, investors must understand competitive threats. In the case of Monster, this is not an easy task. In the high technology space, changes can occur very quickly, rendering business models obsolete. While right now Monster appears to have a solid share of the market, there are many possibilities that could change this in a hurry. Will employers switch their allegiances to free sites like Craigslist? Will Hotjobs or other competing sites offer services at better value? Will new technologies make it easier for employers to recruit without Monster's help? Will a brand new competitor offer a new gimmick or a new way of matching seekers and employers that takes the industry by storm? Investors who are qualified to answer these questions and who believe Monster's competitive threats are benign may see value here. Investors who blindly invest in companies without understanding their competitive environments are destined to get burned every now and then. For most high-tech companies, there is even more of a downside to not correctly anticipating competitive threats: there are no hard assets to fall back on. Monster is no exception. While many of the other companies we like have inventories or properties that can be sold even if the company's future viability should turn grim, Monster offers no such downside protection. Intangible assets represent 70% of MWW's book value; its price to tangible book is 4, whereas we're used to working with P/B's close to 1. Monster's inventory is just a concept, not an asset that can be converted to cash! The company is certainly not going anywhere anytime soon. With ample cash of over $600 million versus just $250 million in total debt, along with its positive operating cash flow, Monster appears to have been discounted by the market. However, it is a long-term value investment suited only to those who have the expertise to determine if Monster can stay on top of its technological mountain. I recently had an opportunity to read Christopher Browne and Roger Lowenstein’s The Little Book of Value Investing. I am a big fan of the Little Book series, and this book continues the trend of superb introductions to finance topics. In this post, I will highlight the key points from the book, derived from the notes I took while reading it. Assets: Look for low Price-to-Net Market Value of Tangible Assets, as these tend to perform better over time. You are looking for stocks trading at less than book value (ideally less than 2/3 BV). Market value is important because it reflects what the company’s assets are today (so some things might be written off or increased). Tangible assets are better because their value is more readily recognized (whereas something like Intellectual Property or a Brand is more difficult to monetize and more subject to sudden deterioration in value. Always use Net values (removing liabilities) so that you can tell what amount of equity the company has in the asset. Cash Flow: Look for low Price-to-EBITDA multiples. This gives an idea of the short-term profitability of the company outside of depreciation and other non-cash expenses. Depreciation can be altered by changing depreciation accounting policies, so removing these is important. Run those three things through a stock screener (Google Finance or Yahoo Finance). the output will be a hit list of potential value investments. Then, look more closely at each company on the list, starting with those companies or industries you are most comfortable with. Site traffic continues to grow! In order to accommodate the site's growing number of readers, we will undertake some changes to improve the usability of the site. Based on some reader feedback we have received, we endeavour to better organize the site's now large library of articles and at the same time make the site more visually appealing. Before we implement the new look though, we'd like to get feedback from our existing readers. So if you can spare the time, we'd love to hear your thoughts on a possible new layout for the blog, which can be viewed here. There's a simple poll on the new site which asks your opinion of that look relative to the current look, but if you have specific comments or suggestions please feel free to leave us a comment on this post or send us an e-mail. Thanks in advance for helping us improve the site! Thanks a lot to Brad for his help in setting up the new look! Private Investment Club. Investor groups of 50 members or fewer are free to sell securities without being regulated. Naturally, hedge funds tend to take advantage of the first two exemptions listed above. This explains why hedge funds are not available to everybody. In his final chapter, entitled The Future of Intuition (and Expertise), Ayres makes the case for why statistical thinking will not replace expertise and intuition. Rather, decision makers will toggle between statistics and intuition. Intuition will guide the questions asked, statistics will answer the questions and test hypotheses derived from intuition. Statistics will complement intuition rather then act as a substitute. Not only will experts be switching between intuition and statistics, but so will average folk. We’ll use statistics to quantify our intuitions, learning how to think more accurately than in the past. We’ll all be forced to become more critical thinkers just to keep up. Conclusion: Statistical analysis is a valuable tool that we should all work harder to understand. In the future, those that understand statistical analysis and can use it to complement their own intuition, will have a greater chance of being successful. The future belongs to these people! 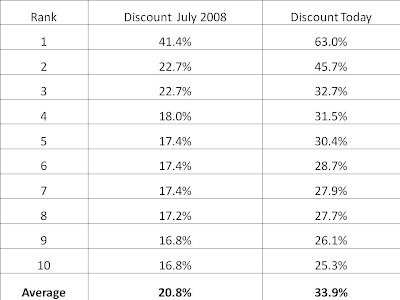 We also saw that near the end of 2008, the median discount for closed-end funds rose dramatically, so the rise in discounts we see in the table above shouldn't come as a large surprise. Of course, this doesn't mean these funds are automatic buys. While investors may appreciate the fact that they can buy assets for a discount in the form of closed-end funds, they should always do their homework (i.e. read the fund's quarterly reports) to ensure they understand what they are buying. For example, if fund holdings are out of date (due to declines in market value) or illiquid, the book value may not be an accurate assessment of the value of the fund's underlying holdings. So how would you have done had you owned these heavily discounted closed-end funds through the market turmoil that took place in the latter half of 2008? We'll explore that in a future post. As you can tell by this point in the book, super crunching is having a profound effect on our lives, whether we like it or not. Ayres gives examples in this chapter of who is losing out due to super crunching. Doctors and other intuitivists are losing out as the status of these professions decreases in relation to the awesome power of super crunching. The problem is that experts tend to give settled answers that leave us feeling a sense of closure. Super crunching gives odds, which leave us unsettled and unclear about what will happen. This is more accurate, but people aren’t used to this. We should see statistical decision making as the rise of meritocracy. Intuitivists are often praised for their historical record, and earn high fees on their future performance even though this is unreliable (See my review of Nassim Nicholas Taleb’s Fooled by Randomness for further discussion of the problems of confusing past performance with skill! ), whereas statistical decision-making minimizes the chances of failure - let the best ideas (statistically) succeed, regardless of who put them forward! For most companies, recessions reduce P/E ratios, as investors withdraw money from the market and become stingy with their purchases. We saw this pattern emerge when we looked at the historical P/E of the S&P 500. We also saw examples of companies trading at their historic P/E lows here and here. But strangely, some companies actually see their P/E's increase during economic downturns, and not only those which sell cheap or defensive products. Consider Fedex (FDX). So what's going on here? 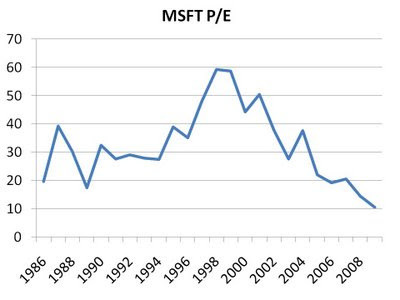 The price component of the P/E value did drop to $40 in 1990 from $64 in 1987. But the earnings dropped even more. When this occurs, the P/E may look extremely large, but the company may still be cheap: FDX rose through $76 just 3 years later. For this reason (and many others which we discussed here), investors should use average earnings when trying to determine a company's P/E, since earnings of one particular year (particularly a recessionary year such as this one) can be misleading. Once again we see that while there was a slight uptick in business bankruptcies in 2002, it was nowhere near levels of previous recessions. While the current bankruptcy level seems low, recall that the year end for this data is June, and things took a dramatic turn for the worse after that. It will be interesting to see quarterly data as it comes out, and it should not be surprising to see 2009 levels reach those not seen since the early 1990s. This data doesn't tell the full story, however. 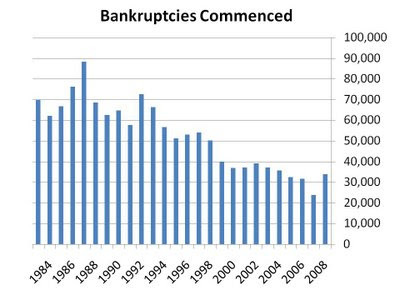 The magnitude of the bankruptcies are not shown; for example, a Lehman Brothers bankruptcy has far more impact than that of a small business, but this data does not account for this. Furthermore, changes to bankruptcy laws over time have change incentives for businesses to file, and therefore makes the data more difficult to interpret. Finally, this only includes business bankruptcies, and excludes consumers bankruptcies, which we will look at in a future post. File a prospectus which includes various required categories of information such as financial statements, management discussion, articles, certificates etc. Not all of these stipulations are required for all companies looking to raise capital. Also, the entrepreneur could farm out part of this process to dealers that are already registered, however it is safe to say the fees would be prohibitive except for those which are part of well-capitalized companies. Regulators do recognize, however, that some of these requirements are over burdensome for many companies. Therefore, there are exemptions available when, in the regulator's opinion, investors do not need the same level of protections as are outlined above. (For example, most hedge funds take advantage of exemptions in order to avoid much of the regulatory pain.) We'll explore some of these exemptions in future posts. * These are requirements for funds based in my jurisdiction of British Columbia, but are very similar to those in jurisdictions across North America. 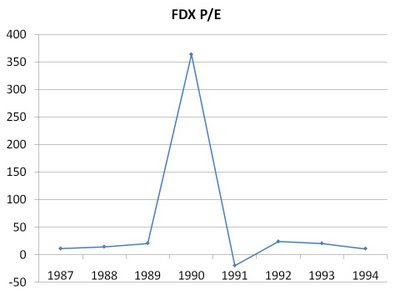 When we looked at the historical book values of FedEx (FDX) and UPS, it was clear that UPS has always traded at a significant premium to its book value as compared to FDX. To understand why, one only has to compare the relative returns on equity* for the two companies: UPS 16.6%, FDX 11.6%. But how UPS manages to generate a higher return on equity may come as a surprise to many. ROE can be further broken down into (Net Income / Assets) * (Assets / Equity). In other words, we can break down a company's return on equity as a combination of its return on assets (Net Income / Assets) and its use of leverage (Assets / Equity). But for both FDX and UPS, return on assets sits at 6.3%! This means the major difference between the ROE for these two companies comes from differing uses of leverage. Indeed, the debt to capital ratio for FDX sits at just 13% compared to 44% for UPS. This means UPS hasn't generated its superior returns through better operations, but rather by using cheaper capital (debt) while taking more risk as a result. Should UPS pay down its debt so that its risk level isn't so high, or should FDX take advantage of cheaper capital in order to generate more returns for shareholders? We'll explore these questions in a future post. *To smooth out fluctations, ratios in this article were taken using the average of the last two fiscal years of each company. 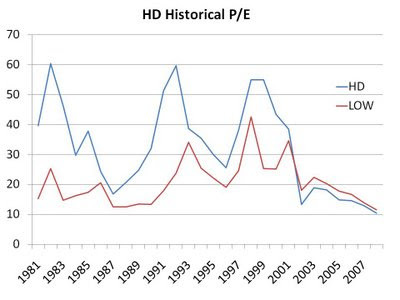 Clearly, HD has been the market's favourite for most of the last 30 years. HD was growing its store count and thus its revenue at a faster rate than LOW, and this is a major reason why. However, as we discussed here, investors tend to overpay for growth. 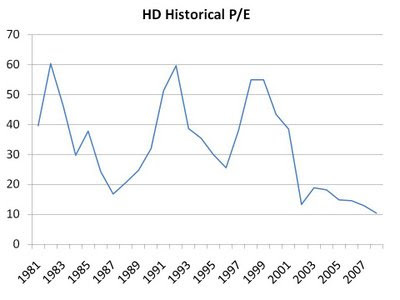 The fact that HD has not been near its 1999 high of $70 suggests this may have ocurred here as well. In the last few years, however, it is LOW that has enjoyed a more generous valuation as far as P/E's are concerned. With HD's declining retail operating metrics (relative to LOW) and growth into other businesses like building wholesale, the market's taste for this company soured. HD has since sold its supply business, ousted its much maligned CEO (who is still maligned at his new company, as we saw here), and brought a stronger focus to its retail operations. As such, the P/E's of these two companies are now quite close. 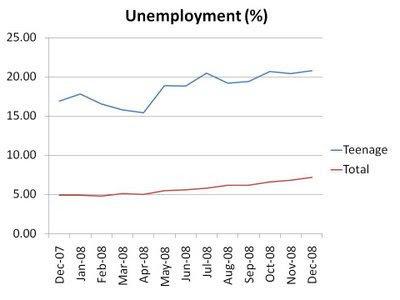 What is most clear from the chart, however, is that this industry is currently out of favour with the market. Last time these companies saw these valuations was during the last real-estate crash (which we explored here). As such, investors are not asked to pick a winner, but are instead offered both companies at low historical prices, allowing for the possibility of long-term returns in the home improvement retail space, without the risk of reliance on a single company. Evidence shows that human judges are “not merely worse than optimal regression equations; they are worse than almost any regression equation”! Regression is not only more accurate, but it is upfront with the proportion of the time the prediction is going to be true. However, regressions only work in the aggregate, and individual occurrences may cause certain cases to become outliers. These are not statistically significant enough to affect a regression output, but are important enough in certain situations that would warrant human oversight. Though, this must be weighed with our human biases that are overconfidence in our ability to outperform the system. Conclusion: Statistical tools are extremely useful in guiding the decisions of experts, but should not obliterate expert discretion. To surrender discretion to the machines, we will lose the ability to take things into account which, while not statistically significant, DO play a role in individual cases. The greatest potential lies in situations where machines guide the discretion of experts based on statistical probabilities toward the best outcome (This is where my previous post, Occam’s Razor, comes into play). We have some use after all! "Sales Trends In Acquired Stores Improved" which means sales still dropped, but not by as much as before. The conference call is even more riddled with tremendous exuberance. Reading management's comments on the press release and listening to the conference call alone would lead an investor to believe this company was profitable, or at the very least generated profits higher than those of last year...but this is not the case with Rite-Aid! Meanwhile, as we discussed here, the company has to undergo a 10:1 reverse stock split just to maintain a stock price above $1 so that it can stay on the NYSE. The company is also trying to sell its stores and lease them back in order to pick up some short-term cash, despite the current dire real estate market! Be wary of managements that can find a glass half-full in an empty glass. Evidence-Based Medicine was developed by two Canadians (Gordon Guyatt and David Sackett). The central premise is that treatment should be based on the best evidence (which, in turn, should be guided by statistical research). Just as super crunching is controversial in other fields, this caused an uproar in the medical community, which largely believes that medicine should be treated by doctors’ instincts. Statistics have also shown several well-ingrained practices (listening to the heart during annual medical exams) and beliefs (Vitamin B12 deficiencies must be treated with shots because pills are ineffective) to be incorrect. Yet, old habits die hard. The key will be to make it easier for physicians to retrieve concise, high quality reports of the results of statistical research. It is currently too difficult and time consuming to find relevant information. Harry Winston (HWD) is a retailer and producer of diamonds, with high-end stores restricted to New York, Paris, London, Beijing, Tokyo and Beverly Hills. The stock has dropped from over $40 to its current price under $5, despite earning $1.17 per share last quarter. It has a book value of almost $800 million (including over $350 million in inventory), but the market values it at just $300 million. Does this stock offer investors a margin of safety? While the company looks great on the surface, this is a classic example of why investors must dig deeper than the surface numbers in order to truly understand and value a company. First of all, most of the company's sales and profits come from its mining operations, not its retail business, which lost $4 million last quarter, on par with the comparable quarter one year ago. This means the company's profits will be heavily dependent on the commodity price of diamonds, which is a situation value investors prefer to avoid. Furthermore, NWD operates just one mine, located in northern Canada. As discussed in Security Analysis, reliance on one location or one supplier or one customer is always a high risk. In the case of NWD, the investor must rely on highly subjective estimates of the lifetime productive capacity of the mine. Even short term production is hard to predict: last quarter, diamond production at the mine was down over 25% because of lower grade material in the portion of the ground currently mined. Finally, while the company's book value looks terrific, a closer examination reveals that much of its value is in the name of intangible assets. Removing these assets results in a tangible book value 25% lower than the stated book value. This company's reliance on uncertain output from just one mine combined with the fact that the value of any units of output is highly uncertain due to volatile commodity prices results in a highly uncertain earnings power for this company. In addition, the value of intangibles is also highly uncertain. As a result, despite the great value this company appears to be on the surface, it's not the worth the risk. 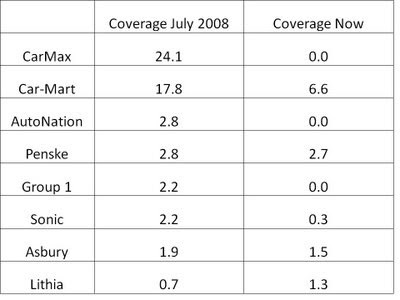 Walgreen and CVS are the largest retail drugstore chains in the US. As such, their financials are often compared. 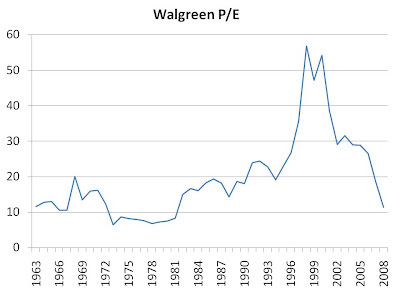 With a P/E of 13.50 for CVS versus just 12 for WAG, the investment community gives CVS the edge due to its faster growing sales and profits. But such a superficial approach to determining the better investment ignores the most important question when it comes to selecting an investment: returns on invested capital. Any investment a company is required to make is less money in the hands of shareholders. Therefore, if one company can generate the same profits as the other but using much less capital, its shareholders will benefit. For a full discussion of this concept, see the discussion here. As a result of its strong returns and lower capital requirements, WAG was able to pay a dividend higher than that of CVS in 2008 despite lower net income levels. 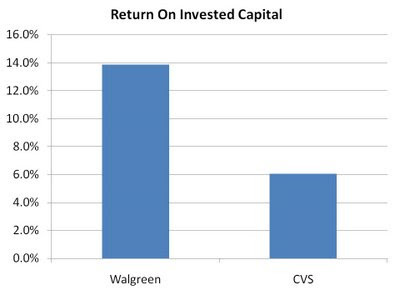 If this difference in returns is persistent, CVS may show higher profits, but would nevertheless be the inferior company for shareholders. If you're an existing subscriber, you'll also notice we've added advertisements to the top of our feed. We receive advertising dollars each time a user clicks on one of those ads, and so with our growing subscriber count it made sense to open up this revenue stream. Hopefully these ads aren't getting in the way, but let us know if you have any concerns! Please stay in touch by continuing to let us know what you like or don't like about the site! For instance, what are your favourite types of articles? Companies that have taken to super crunching have begun generating their own data by running randomized experiments for new products and marketing approaches. They randomly split prospects into two groups and check which approach works best, then use regression to find the relationships. Why do this? Causation! By looking at historical data, it is difficult to determine causation (many variables). By looking at a large random study, you don’t need to control for causation if the groups are equally representative (and you have a sufficient sample size). When you see one group reacting differently, you know the cause is the different approach taken with that group. Conclusion: Use the randomized data approach to bring your customer’s voice into marketing decision making; remove the gut instinct or intuition of the marketing department and consultants. By listening to the consumers themselves, you will make the most profitable decisions. Williams-Sonoma (WSM) has been thrashed by the market. As a retailer of specialty home products, it has seen revenue declines on the order of 20% from last year thanks to the deflating housing bubble. The stock, however, has been beaten down by over 80% from its high at the height of the boom. With a price to book value under 1 and a P/E of 6, this stock appears to offer value at its current price. The company has earned an average of $1.75 per share annually in the last four years, while the stock trades at just $8.31. While we may not see earnings return to those levels for some time, depending on the length and magnitude of this downturn, there are several reasons to believe the company can survive and be profitable in the coming years. First of all, its debt to equity ratio sits at just 2%. While the company does have operating lease commitments, many of them expire in the next 1-3 years, giving the company the flexibility to either close cash negative stores, or negotiate costs downward. Furthermore, the company's sales channels are not limited to retail locations. Almost half of WSM's revenue comes from catalogue sales. Since such sales require less in the way of assets, it is much easier to scale down costs in this business as compared to the bricks and mortar model employed by most retailers. Costs of a variable nature (rather than fixed) can be a tremendous strength when the economy is contracting. The company also has a wide array of brands and store concepts, including Pottery Barn and West Elm, in addition to the Williams-Sonoma brands. This diversity reduces the risk that one brand or store concept that goes out of fashion will permanently impair the company. While there is no current end in sight for the housing industry drought (which we've expored most recently by looking at inventory numbers), WSM looks like a stock that can outlast the downturn, and represents a great value opportunity for those with a long-term outlook. The Wisdom of Crowds allows groups to help find things that are best for individuals. By telling Amazon what books you like, it can tell you what groups of people who have bought those books have liked as well. This kind of data mining - from group behaviour to create individual recommendations - has been shown to be more effective than regular book or movie reviews (in that individuals report greater satisfaction with the recommendations). Regression: A statistical tool that looks at raw data (what happened) and derives relationships between variables to help make predictions about the future. This is one of the most powerful tools in the arsenal of modern analytics practitioners. The output of regression is an equation of the line that best fits the raw data. This equation is then used with different inputs to generate the output of theoretical scenarios. Finding these relationships is important for business: helping companies assess demand and move to just-in-time inventories, assess the true characteristics of good employees and thus reduce turnover, and determine which customers are likely to leave and how this can be prevented. Conclusion: Companies won’t survive as their competitors become super crunchers, learning how to extract more profitability from their customers while preventing them from defecting and simultaneously learning how to most efficiently steal your best customers. As a businessperson, you need to learn how to become a supercruncher, just so you can survive. As a customer, you need to be vigilant in your dealings with companies that are soliciting your business (this is an indication you’ve been overpaying!) or offering you extra features at a price (these are often not a good deal!). We can see from the above chart that WAG has not traded at such a low P/E for quite some time, which may offer long-term investors the opportunity to profit from a potential P/E expansion when positive investor sentiment returns. However, a company's P/E value does not take into account its level of debt and is furthermore affected by one-time items which may distort a company's "normal" earnings. As such, in future posts we'll compare WAG to its competition (CVS, RAD) keeping such items in mind. The Efficient Market Hypothesis (EMH) asserts that stock prices appropriately incorporate relevant information. As such, it isn't possible to generate market beating returns because the current price reflects available information. While it's not possible to completely disprove this theory (EMH theorists attribute the success of Warren Buffett and other value investors we've looked at here to random chance), there are examples which make this very difficult to believe. Consider CVS Caremark (CVS), a provider of pharmaceutical services. 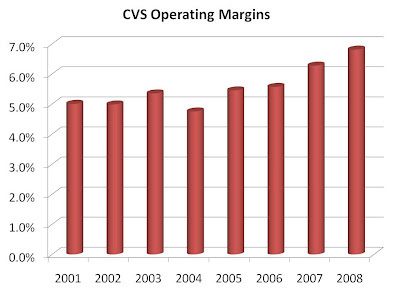 We can see from the chart above that CVS has maintained margins through downturns, as one would expect considering its industry. The stock price, however, tells a different tale. The stock has dropped 30% in just the last few months, despite very little change in the earnings or earnings outlook for this business. If the market was right when the price was $43 then how can it be correct now at $27, when little has changed. Examples like this certainly offer doubt as to whether the market always appropriately values stocks. While this doesn't neccessarily mean CVS is undervalued now (as perhaps it was just overvalued before), it does suggest there are profit opportunities for those who are able to take advantage of Mr. Market's mood swings. Shares in TAT Technologies (TATTF) rose last week as the company announced a plan to buy back around 10% of the company's shares. Shares usually do rise in response to such announcements, as they imply that management believes a company's shares to be undervalued. Since management knows the business better than anyone, the market responds positively. Unfortunately, investors cannot rely on announcements such as this in order to determine whether a company is undervalued. First of all, because such announcements usually result in a stock price boost, unscrupulous managements can use this method to simply boost the stock price to a level higher than it otherwise would be. Furthermore, managements are subject to the same psychological forces that govern the market, and as such they can often be woefully wrong about whether a stock is undervalued. Often, there are also incentives for managements to buy back stock other than a belief that the stock is undervalued. For a discussion on such incentives, see this article discussing the terrible buyback decisions of several large companies. To determine if a company is undervalued, the investor's best approach is still to determine an estimate of the company's intrinsic value (which we discussed here for TATTF), rather than relying on fruitless attempts to gauge management's opinion of a stock. Analytics is about relationships. When we make decisions with our gut (AKA Intuition or Common Sense), we are really using a complex set of relationships we have formed in our minds over our lifetimes (and partially through genetic hand-me-downs). This may work for knowing “RUN!” when we see a rabid dog running toward us with teeth exposed, but when it comes to finding the optimal solution for distributing newspapers from three different points of supply to thirty different distribution points, taking into account transportation costs, relative production efficiencies and a host of other variables, it turns out that our brains are not up to the task. This is where analytics comes in through the use of different scientific methods for extracting the true nature of the relationships between things, so as to find the optimal solutions. Unfortunately, analytics doesn’t play a large enough role in decision making. Too often, the old guard has been founded on its “expert” opinion-making abilities. Wine and art critics feel scientific methods can never do what they do, let alone better. Though the proof is in the pudding: Orley Ashenfelter has proven to be more accurate with his scientific analysis of wines than Robert Parker’s “expert” senses, and Bill James proved better at picking baseball players than major league scouts, each determined on objective standards. Experience and Intuition are losing out to analytics, and we seem to be on the cusp of major change. In the future, these techniques will become increasingly important, and so it is a valuable book to learn about the power of analytics and how it can help you do everything you do! It's no secret that one of the main reasons Japanese automakers have triumphed over their American competition is productivity superiority. In other words, the average worker at a Japanese automaker can make more cars in a year in the same amount of time as a worker at an American automaker. When combined with the much publicized labour cost differences between the firms, a huge advantage emerges for the likes of Toyota and Honda. What is the source of this productivity advantage? According to a paper by UCLA professors Lieberman and Demeester, a great source of the productivity advantage comes from forced reductions in work in progress inventory. When buffer inventories between manufacturing stations are kept high to ensure manufacturing disruptions are kept low, manufacturing inefficiencies are masked. With Just-In-Time inventory programs, historically implemented by Japanese companies to reduce inventory requirements because of high storage costs, firms are forced to improve manufacturing processes. The paper asserts that each 10% reduction in work in progress inventory results in a 1% gain in productivity after one year. The full text of the paper is available here. In a related post, we've discussed how to determine if a company is managing its inventories well. 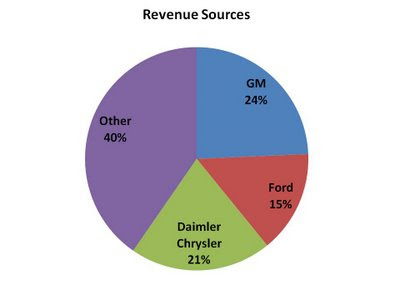 We also saw that GM and Ford were both value traps back in 2004.